This was the moment a flight of RAF Tornado jets flew past a steam locomotive named for them in North Yorkshire yesterday (February 19). The Royal Air Force has discontinued their fleet of Tornado fighter jets after 49 years of service. The Italian-made aircraft is seen doing one of its many final flypasts before being permanently grounded from British military use. The jets' position in the RAF will be replaced with F35Bs. 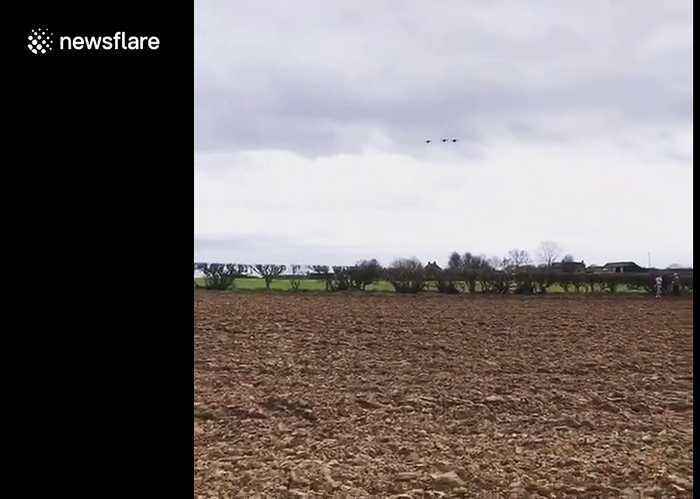 The filmer said: “This video was filmed along the Wensleydale Railway Heritage Line and captures the RAF Tornados final flypast over the steam locomotive Tornado which was built by the A1 Trust in Darlington and named after the RAF Tornados. “The Tornado locomotive was visiting Wensleydale Railway for the first time especially for this event. "The RAF Tornados are now retiring so this event will never happen again.